Save on Monoject Softpack Insulin Syringes. 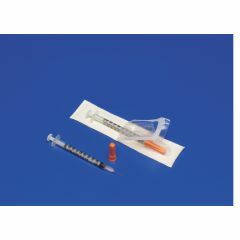 The insulin syringe features a one step peel-away package to facilitate easy opening for aseptic handling. Easy to Use. Economical. Safe. Durable. Accurate. Reliable. Painless. Lightweight. Portable. Sturdy. The product preforms well and the service is fast. Dull points on this one. Good Body Strength. Easy to Read. Sturdy. Lightweight. I use the needle for igf shots daily and the points have caused numerous bruises because the points are so dull. I will still use the box I have ut I would like them sharper next time. Easy to Use. Economical. Safe. Accurate. Reliable. Painless. Lightweight. Easy Storage. Very VERY fast shipping from Allegro Medical. Product as described. Easy to Use. Reliable. Economical. At home. Chronic care. Adults. I can buy in bulk and save time and money. Can you remove the needles from the syringes? I use a different size needle, but I need this size syringe and I can't find them being sold without needles on this site. No, the needles are fixed and not removable. No you cannot remove the needles.They are permanently attatched. is there a smaller length insulin syringe length than 12.7mm with a 29 guage? Yes, a very small 29gauge by 1/2 inch needle. Each time a needle is re-used it removes lubricant from the needle & looses sharpness. Ouch! Does this have a needle? Of course. This is a one piece insulin syringe. You do not need to attach a separate needle as you would an inner-muscular syringe. We use these for our blind, diabetic dog. He takes 18 mg 2X per day. He does not seem to mind the injections, presumably because the needles are so small.